For the past year, the neonatal intensive care units at the Montreal Children’s Hospital (MCH) and the Royal Victoria Hospital (RVH) have been working on clinical harmonization in preparation for their move to a single NICU facility at the Glen site. 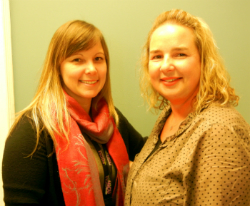 As part of the process, MCH nurse Kim Ervens and RVH nurse Marnie Chuipka have been working on new protocols that will help the NICU standardize its processes according to best practice guidelines in neonatal care. While working together, Kim and Marnie began to see an opportunity that would benefit nurses on both teams, one that would allow nurses from each unit to spend the day at the other NICU, effectively ‘shadowing’ Kim or Marnie for the day, observing them work and learning about their practice. The nurses are given a questionnaire afterwards to get their input on the project. Kim and Marnie also keep their supervisors and managers up to date on the progress. They have found that each nurse comes away with their own experience, which they are sharing with colleagues afterwards.